WITS Services Department plans to hire more women drivers in line with the Employment Equity Plan, the university’s transport operations manager, Timothy Mudau, has said. 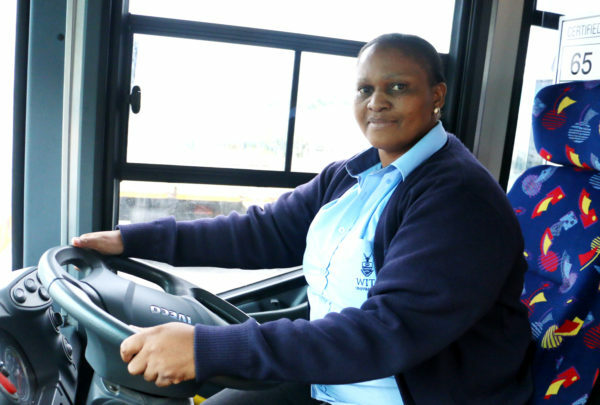 In November last year Rebecca Phutsi Makgabo became the first, and so far the only, woman driver to be hired by the department. Her hiring was in line with the Employment Equity Act 55 of 1998, which the university’s Transformation and Employment Equity Office adheres to. “Should there be more bus driver vacancies, the principles in line with the employment equity plan will be applied,” Mudau said. Makgabo, 43, is a mother of three who is temporarily working part-time. She drives the Yale Village-Main Campus-Education Campus route from 6am to 12:30pm on weekdays. On Saturdays she does the Main Campus-Knockando-Yale Village-Rosebank route from 8am to 6:30pm, and on Sunday she does the same route from 8am to 4:30pm. Her family’s only complaint is that she always leaves home early in the morning. This is because she uses public transport from Kliptown, Soweto to get to Wits. Makgabo’s co-worker and campus bus driver, Clive Dlamini, told Wits Vuvuzela she is a strong woman who understands the industry very well. Makgabo, who previously worked with South Africa’s oldest and largest bus company, Putco, said she had not known there were still youths who were respectful. “Students from Wits have respect; they are so humble compared to where I come from,” she told Wits Vuvuzela. Her wish is to grow at Wits and further on do a risk management course.